A central panel worked in Tunisian simple stitch, purl and slip stitch makes an eye-catching counterpoint to the outer border worked in classic single crochet and chain stitches. 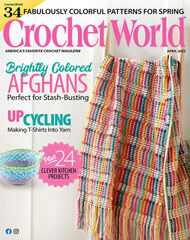 This e-pattern was originally published in the Winter 2013 issue of Crochet! magazine.